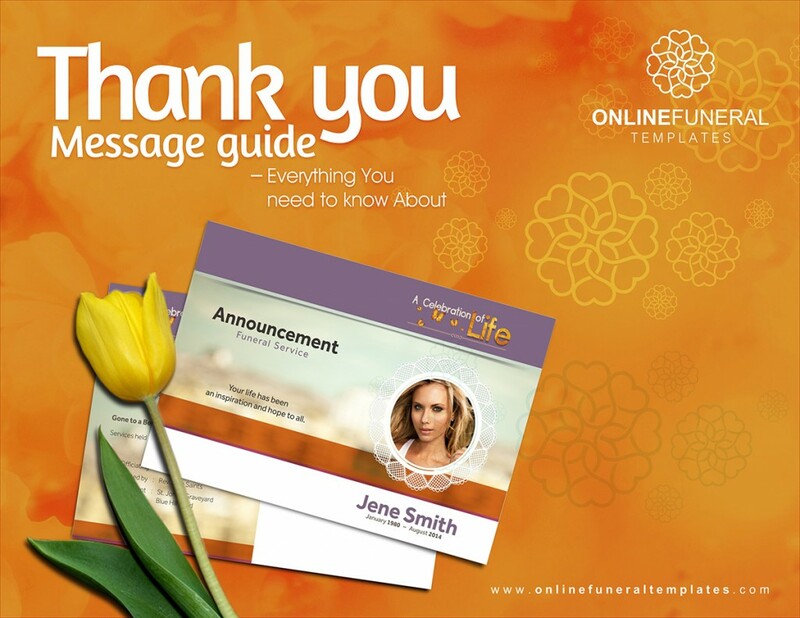 Under THANK YOU MESSAGES Tags: EXAMPLES OF THANK YOU MESSAGES, Funeral Prayer Cards, funeral quotes, Funeral Templates, THANK YOU MESSAGES, WORD OF COMFORT EASY FUNERAL PROGRAM TEMPLATES. permalink. Undeniably, Funeral is a sad experience in everyone life. It’s a time when we all are feeling low and sad due to the loss of the deceased person. During the proceeding of funeral, all the family and friends arrived to proffer the love and comfort to reduce the suffering of the main family. In turn, the family members provide Thank you wishes to everyone who arrive at the funeral, as a token of gratitude for their presence in such difficult moment. All the wishes can be easily sent electronically or through print mediums with the help of elegant Thank you cards. We at online funeral templates, believes wholeheartedly in helping people in such difficult situation, that’s why here we are providing a list of Thank you messages given at the time of funeral, including the Thank you for Funeral Directors, Thank you message for funeral program, Thank you for funeral contribution, Thank you message for funeral flowers, etc. Thank You Message For Funeral Donation. Basically, Funeral donations are the cash donations made to the concerned family to perform the funeral proceeding in the ideal manner. Although, these donations can be easily made in the name of the departed person, to be used in the funeral or to placed in the name of the giver for philanthropic purposes. Well, Today we have talked about the different Thank you messages to be sent a post funeral. There are so many ways through which one can send Thank you messages, through cards, text messages or elite online Funeral Announcements and Funeral Prayer Cards Created By Online Funeral Templates. If you are the one looking for any other funeral templates, Funeral Prayer Cards, Or Easy Funeral Program Template, then don’t feel hesitate in contacting us. We will be more than glad to assist you. Stay Tuned For Our Next Exciting Blog!